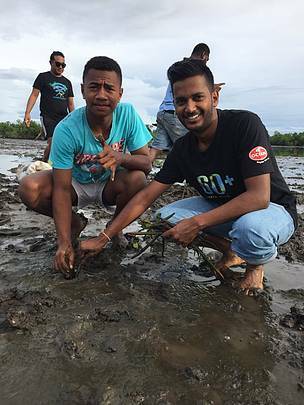 Ocean Soaps supported this year’s Earth Hour mangrove replanting and waste management activity at Korovou village in Tavua. 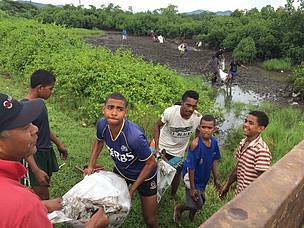 The support provided is part of Ocean Soaps corporate responsibility towards assisting coastal communities restoring the health of their fisheries and help to fight against the impact of sea level rise. 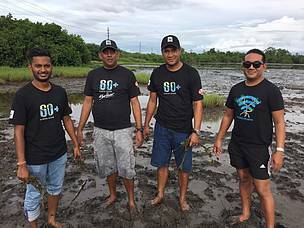 With this year’s theme focused on #Connect2 Earth, Ocean Soaps pledged their continued support for Earth Hour 2019 strengthening their commitment to Earth Hour in Fiji since its inception in 2007, as an initiative in helping to resolve challenges in our society. At Ocean Soaps, we are committed to produce Environmentally Sustainable and ecologically friendly lines that do not harm reefs and water systems. We have directed our energies and focus towards becoming an environmentally friendly company. We are manufacturing products which are harmless to our surroundings, yet still have the same performance factor. A number of Ocean Soaps products were developed in consultation with conservationists to ensure that products are biodegradable. This has also been achieved by the removal of harmful phosphates, replacing chlorine bleaches with oxy bleaches as surfactants. This ensures that our coral detergent powders are cold-water-wash, therefore, energy-saving. We are honored to be in partnership with WWF to host this yearʼs Earth Hour. Humanitarian solutions to a global crisis are the building blocks in changing the way we respond and adapt to climate change. We must raise awareness about climate change so that our communities are mindful that there is a need for an interconnected approach. Having supported Earth Hour for more than a decade through their “Lights out display”, Ocean Soaps sponsorship continues to reinforce our support towards understanding the impact we have on our environment, especially in terms of development and the need to responsibly manage the use of natural resources. WWF’s switch off for one hour is also an initiative for all businesses not only in Fiji but across the Pacific to focus their attention on protecting our environment and the planet and we are delighted to support the campaign by raising awareness on climate change through focusing on the need to protect biodiversity. (L-R) Participant Abkshay with WWF Pacific staff Vinesh, Adriu and Alfred.